These awesome earrings are totally fashion forward and gorgeous, as you can tell we love them! They are made up of a single sterling silver arrow stud measuring 1.5cm in length that points up your ear. 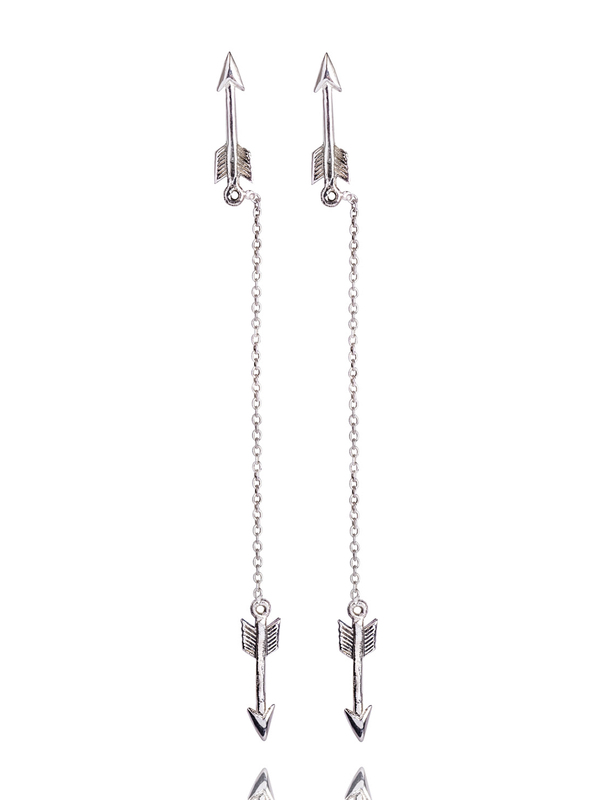 The drop is 7cm in length and this measurement includes the silver chain and the single sterling silver arrow. Get in quick! Our classic hoop enjoys a style upgrade with the addition of a sleek, beautifully balanced, detachable t-bar. Giving you two styles in one, this luxurious earring is understandably the fashionista's choice. The hoop is 1.5cm in drop and the t-bar 1cm wide. These elegant, gold plated studs turn the must-have hoop on its side for a modern spin on a design classic. This earring has a 1.5cm drop. This eye catching earring is a modern spin on a hoop classic. Featuring a beautifully balanced, detachable t-bar elevates the impact and gives you two styles in one. A chic and compelling choice. The gold plated hoop is 2.5cms in drop and the t-bar 1.5cms wide. Minimal in design, these enchanting, gold plated hoops - the smallest in our collection - are an absolute style staple. Wear day in, day out for a less-is-more look. The hoop is 1.5cm in drop and 3mm thick. Our classic hoop enjoys a style upgrade with the addition of a sleek, beautifully balanced, detachable t-bar. Giving you two styles in one, this luxurious earring is understandably the fashionistas choice. The gold plated hoop is 2.5cm in drop and the t-bar 2.5cm wide.